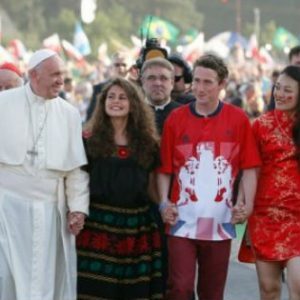 He writes: “This theme is an expression of the pastoral care of the Church for young people, and is consistent with the results of the recent Synod assemblies on the family. 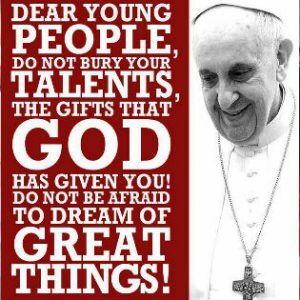 Its aim is to accompany young people through a process of discernment leading them to discover their plan for life and realise it with joy, opening up to the encounter with God and with human beings and participating in building up the Church and society. In January 2017, young people all over the world were invited through their parishes, schools and/or dioceses, to respond to a survey. The specific group is those who are 16-29 year old and is not confined to regular church-goers. If you were not able to reply or if you didn’t know anything about it, you can find the background, goals and questions related to this survey here. From 3-9 April 2017, a representative group of young people met in Rome with the Vatican Commission for Marriage and the Family, led by Cardinal Baldisseri. On Saturday 8 April, Pope Francis spoke with them at the Basilica of St Mary Major. In September, Ashleigh was again invited to participate in a much smaller gathering of just 20 young people in Rome. The text of her presentation is available here. Every person is called by God to a particular way of life which, if lived faithfully and generously will bring true happiness to themselves and others. By our Baptism, each of us is invited to discover our place in God’s plan for the world, be it a particular profession or trade, and at a deeper level, as a married or single person or a member of consecrated life (religious sister, brother, priest). It is important to remember that every person has a vocation and that the term is not limited to those in consecrated life. At the same time, it applies in a particular way to young people who may be considering a call to become a sister, brother or priest. Such a call is a gift offered to some people by God as the way in which they can best fulfil God’s unique plan for them. It is lived out in the context of the Church and of a particular religious congregation. Over a period of time, as we grow to adulthood, this discernment means thinking, praying, seeking advice and becoming aware of a whole range of options that best match our gifts, talents and interests. In order to support young people along this journey, our long history of Christian spirituality within the Church offers what is known as spiritual discernment (further thoughts on this are given below). Another word for this is accompaniment, that is, that adult members of the Church, the people of God would accompany young people on this journey of coming to decide where God may be calling them. Following the meetings with young people in April and September, another group was invited by CICLSAL (the Vatican Congregation responsible for consecrated life) to meet in Rome 1-3 December 2017 in order to share their experience of accompanying young people in their faith journey and vocational discernment. Almost 800 religious women and men thus came together to meet under the warm and encouraging leadership of the Prefect of CICLSAL, Cardinal Joao de Aviz, and the secretary Archbishop José Carballo OFM. Sr Margaret Beirne rsc was the representative from Australia. She writes: “For many participants, their ministry is linked to youth ministry and is not therefore exclusively about vocations to consecrated life. However, we recognised that this was the key focus of the Congress. “While specifically on the topic of vocational discernment and the upcoming Synod on Youth and Vocational Discernment, it was also a much broader experience of the universal Church: Different languages, cultures and experiences. “One of the pluses was that Cardinal de Aviz and Archbishop Carballo stayed for the entire three days. They lined up for breaks and lunch with the rest of us, were visibly attentive and listening throughout every presentation and spoke in response with great enthusiasm and encouragement for all the participants – they’re clearly supportive of Pope Francis! It gave a real sense of true communion across the different groups within the Church. “While the main language was Italian, the various prayer sessions and Eucharist included readings and prayers in representative languages. 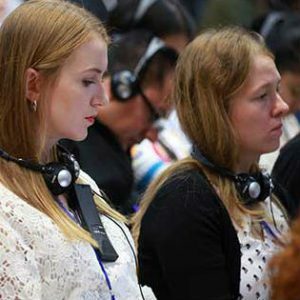 For the plenary sessions, we each had a set of ear-phones with immediate translations into our own native language. These presentations were largely reports from each continent either on (a) what is already taking place in this area of youth and vocational accompaniment or, (b) in the case of the USA and France, a report based on a comprehensive survey in their respective countries. At the closing Eucharist on the final day, the presentation of the gifts was led in by 10 African Sisters singing and dancing. Together with much of what took place over the three days, it was a fitting reminder of the presence of God alive and well in our world and the rich cultural and religious treasure that is possible when we come together to pray, worship and share as the universal Church. This was an immensely valuable experience, providing me with a deep sense of the global Church community, the wealth of efforts already being poured into this special ministry, and the value of listening and learning from one another at all levels of the Church.